AGORA is one of the five programmes making up Research4Life. The other four Research4Life programmes are Hinari, OARE, GOALI and ARDI, covering research in health, environment, law, development and innovation. AGORA was launched in 2003 by the Food and Agriculture Organization (FAO) of the United Nations in partnership with Cornell University and up to 65 of the world’s leading science publishers. AGORA/R4L provides free or low cost access to peer-reviewed journals and e- books (in agriculture and related biological, environmental, social and other research domains) to more than 3,400 institutions from more than 115 eligible countries*. These institutions receive free (or low cost/US $1,500 per year - for institutions in a Group B; an effective discount of over 99.9%) access to journal and book content via the joint Research4Life platform/access point. The main purpose of AGORA is to improve the quality and effectiveness of agricultural research, education and training in low- and middle-income countries. NOTE: an individual cannot register to R4L. Registration is institutional and restricted to eligibility of the country and type of institution. Types of eligible institutions: including national universities, professional schools, research institutes, government offices, national libraries, agricultural extension centers and local non-governmental organizations. With research output currently booming in Africa, Asia and Eastern European countries, there is great potential for research to be promoted and ‘translated’ through AGORA into innovation across many sectors. Even though AGORA is about opening access (AGORA provides access to many full-text resources in Agricultural Research), it is not itself an Open Access initiative; AGORA and Open Access need to be seen as complementary initiatives. Click on Content Portal tab on the AGORA home page. To search full-text inside AGORA, you can use Summon** - AGORA’s Google-like search engine. Depending on how vague specific your search is, you’ll be linked directly to scores of resources that match your keywords. You will be reminded to LOGIN to AGORA to access its content. Some results may be restricted according to country and institution (check your access to the content by clicking on the ‘check access’ tab). 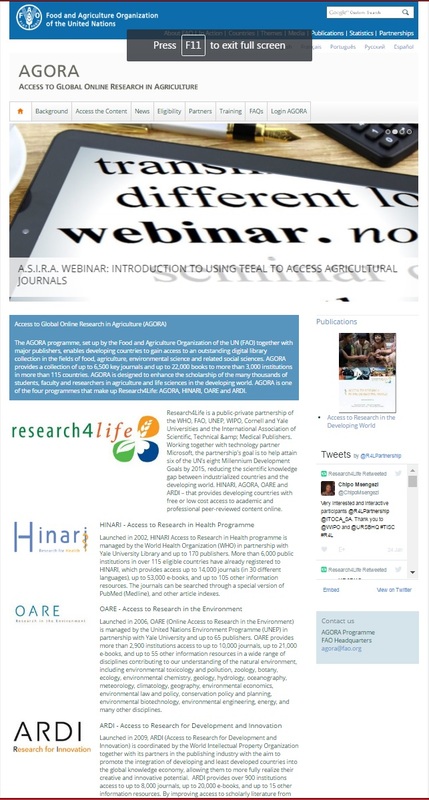 Through Forums on Open Data and Open Science - being promoted at the international level by FAO - stakeholders and target groups can enhance their skills and capacities concerning the use of AGORA and the International Information System for the Agricultural Science and Technology (AGRIS), to access to and make the best use of online, peer‐reviewed literature in agriculture and related sectors. For institutions based in Group A countries, access through Research4Life is free. ** Get Full-Text content via Research4Life enhanced with new Country-Specific Search in Summon!